As many as 50% of businesses close following a disaster, according to the latest research. Of the businesses that survive, the overwhelming majority of them has a preparedness plan in place. Pre- planning can serve as an insurance policy aimed at peace of mind. And knowing you are "Ready for whatever happens" speaks trust to your clients and employees that in the event your business is affected by a disaster, they don't necessarily have to be. By developing a "SERVPRO Emergency READY Profile" for your business interruption by having an immediate plan of action. Knowing what to do and what to expect in advance is the key to timely mitigation and can help minimize how water and fire damage can affect your business. Preparation is a key component for making it through any size disaster, whether it's a small water leak, a large fire or an area flood. The best time for planning for such events is not when the event happens, but well before it happens. No one ever plans on a disaster, but you can plan for it. Now is the time to ask yourself, "Are you Ready for whatever happens?" SERVPRO specializes in the cleanup and restoration of residential and commercial property after a fire, smoke or water damage event. We can handle any size disaster! Storms Are Coming...Are You Ready? Cold temperatures can take their toll on your home and property, it is important that you prepare your home for cold weather to limit risks and potential damages. When preforming maintenance and insuring that you are limiting risks of damage it is important to be thorough while inspecting your home. There are many easy steps you can take to help in the attic of your home; weather strip & insulate the access door from your attic into your home, seal around your chimney with metal flashing or a high temperature sealant, seal around plumbing vents, seal any holes between the heated space and the attic and insulate any exposed water pipes. If water damage occurs in your home due to extreme weather or anything else, make sure to call SERVPRO. Do You Have The RIGHT Fire Extingusher? A fire extinguisher can be a life-saving tool when used correctly. The U.S. Fire Administration (USFA) recommends individuals are properly trained in order to use and maintain an extinguisher. • You have alerted other occupants and someone has called the fire department. • The fire is small and contained to a single object, such as a wastebasket. • You are safe from the toxic smoke produced by the fire. • You have a means of escape identified and the fire is not between you and the fire escape route. • Your instincts tell you that it is safe to use an extinguisher. Class A: Use on ordinary combustible materials, such as cloth, wood, rubber, paper, and many plastics. Class B: Use on flammable liquids, such as grease, gasoline and oil. Class C: Use on appliances, tools, or other equipment that is electrically energized or plugged in. Class D: Use on flammable metals and are often specific for the type of metal in question. These are typically found only in factories working with these metals. Class K: Use on vegetable oils, animal oils, or fats in cooking appliances. These are generally found in commercial kitchens, but are suitable for the residential market. SERVPRO specializes in the cleanup and restoration of residential and commercial property after a fire, smoke or water damage event; as well as mold remediation. We can handle any size disaster! Preserving Contents From Your Home After A Fire! Fire damage, including smoke and soot, affects not only the structure of your house but also your belongings. SERVPRO understands your family’s furniture, clothing, keepsakes, and other belongings are the very things that make a house a home. Last week this local commercial building suffered a large water loss. 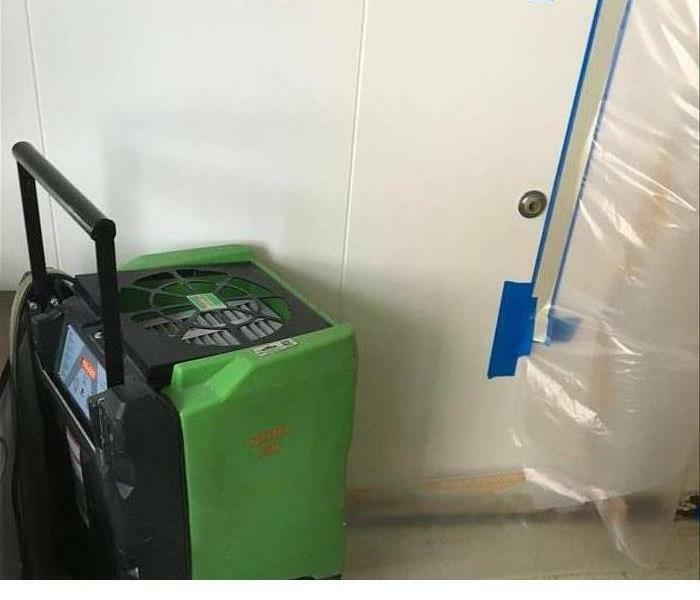 In this particular instance, SERVPRO was called after hours to respond to the unpleasant surprise for the local building. SERVPRO responds day and night and is always "faster to any disaster". The first night SERVPRO responded, the water level was higher than expected. But in just a few short hours SERVPRO had the water drained and were beginning to clean the area. After the water was drained, they could begin the drying process. Luckily, our team has all of the necessary equipment and we were out of there in just a few days! Making Water Damage "Like it never even happened." A few weeks ago, a local building suffered severe water damage. Members of SERVPRO have been at the local establishment everyday to dry out the affected areas. When a large amount of a building is damaged by water, the areas need to be assessed for the severity of impairment. All areas need to be dried as best as possible. The other areas need to be addressed in other ways if the severity is high. For example, some areas of the wall may have to be cut out in order to prevent mold from growing. However, in this instance, SERVPRO is using specific tools in order to help quicken the drying process. In the featured picture, are team is using a dehumidifier and a duct tube to help localize heat to the specific areas that need to be dried. This process will get rid of any water that remains in the walls or ceiling. In early summer, a sprinkler burst in a building on one of our local campuses. SERVPRO was more than happy to help our local university. There was standing water in the floor of the building when SERVPRO arrived on the scene. The sprinkler had dispensed water on the floors and the ceilings. When water damage is concerned, it is important to act relatively quick to ensure that the damage is contained. If the situation gets much worse, it can advance to more than just water damage. Typically, if the water is extracted, properly dried out and restored, the area affected should be alright. The area needs to be dried out within 48 hours. However, 24 hours is ideal. It takes mold 24 to 48 hours to begin growing in the ideal conditions. Sometimes, if not dried properly, mold will start growing but not visible just yet. When the water eventually dries, it will begin to show spots on the walls. Luckily, in this case at our local university, SERVPRO acted quickly. SERVPRO knows the risks of water damage worsening and are always on the scene as soon as possible. The water was dried and the job done efficiently. 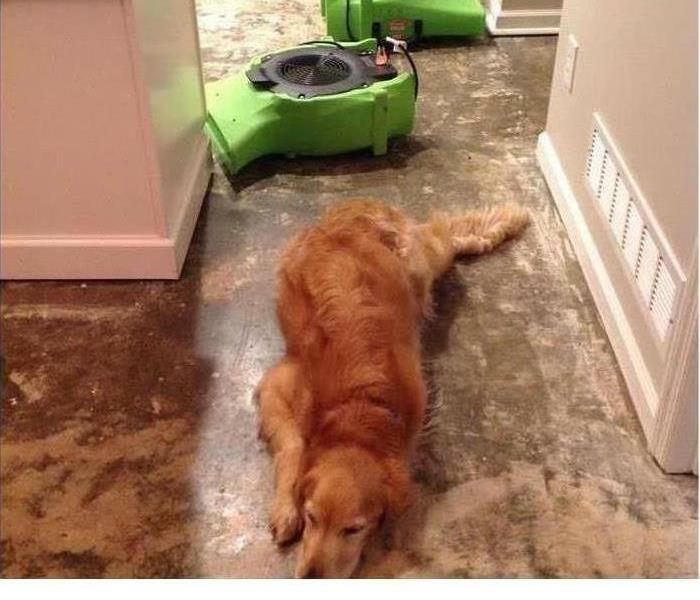 SERVPRO is always happy to help. Any time you experience water damage in your home it can be distressing. Coming home to or waking up and discovering water damage can throw off your entire day. Once the damage is discovered, you begin the process of making phone calls and going through the steps to repair the damage. Often times when water damage occurs the customer has to live in their home throughout the process. In severe cases they may find other temporary arrangements. When we come into your home during your frustrating time, it is our goal to make sure that the process of getting your home back in order is as stress free as possible. We will come in a set up our drying equipment in the affected areas and perform any necessary demolition to wet materials. We always strive to have the home dry and have equipment removed within 4 days. At that point the customer can choose to complete the necessary repairs. In the case that you ever experience water damage, rest assured that we can take of you! Last week SERVPRO got a phone call that two sump pumps had failed at a local university. It was in the basement of the building. When the sump pumps failed, the bathroom flooded with water. Shortly after, the elevator shaft was full of water. There was also water that had leaked into multiple rooms of the large university building's basement. Fortunately, SERVPRO was there to save the say. Unfortunately, the damage was done. Water had been standing in several rooms and seeped into the walls long enough to make a severe impact. It only takes mold 48 to 72 hours to begin growth. By the time SERVPRO members arrived and could get to the inside of the walls, mold began to grow. Our team members cut all of the wall space out that was affected. They spent multiple days drying the area out. Even though the area had already been affected, it is SERVPRO's job to make it "Like it never even happened." 3/7/2019 - Storms Are Coming...Are You Ready? 3/7/2019 - Do You Have The RIGHT Fire Extingusher? 3/7/2019 - Preserving Contents From Your Home After A Fire! 1/30/2019 - Making Water Damage "Like it never even happened." 1/30/2019 - When "Sump"thing is up!